When it comes to murder, nothing is sacred . . .
For centuries, mourners in Derbyshire have used the Corpse Bridge to cross the River Dove and reach their village burial grounds. When a developer plans to deconsecrate the land by turning it into a parking lot for his resort cottages, bodies begin to litter the road to the Corpse Bridge. Are these warnings to stay away from the sacred plots—or something much, much worse: a terrifying serial killer at work? 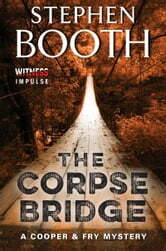 After recuperating from a traumatic event, Detective Cooper is finally back at work, and he knows that solving the mystery of the Corpse Bridge is exactly what he needs to feel like himself again. But if Cooper can't overcome his own personal demons and focus on the case, he could put everything—and everyone—he cares about at risk . . . I love Stephen Booth's books. Ben Cooper 's local knowledge and people skills comes through very nicely. If only he could figure out Diane Fry.